This is a particularly fine example of a three-quarter-length variant that Gheeraerts and his studio produced, deriving from the artist’s famous full-length which has descended in the collection of the Dukes of Bedford at Woburn Abbey. That painting was commissioned soon after the earl’s triumphant return to England following the capture of Cadiz from the Spanish in August 1596. Our version has a terminus ante quem of 1599, when the earl was appointed Lord Lieutenant and Governor General of Ireland, after which other versions show the earl holding the baton of his office. In our portrait Essex wears a black velvet riding cloak, and the choice of the black and white costume is a clear allusion to colours favoured by Elizabeth I, alluding the purity of the Virgin Queen. Mrs. Barbara Overland, Mont Pelier House, Jersey, until 2015. As one of the most famous and recognisable of all Elizabethans, Essex was always well poised at court as the stepson of Elizabeth I’s favourite, Robert Dudley, 1st Earl of Leicester, and given that his own mother, Lettice Knollys, was descended from Mary, the sister of Anne Boleyn. From the heights of his success as a favourite of the Queen, and the hero of Cadiz, his failures in Ireland and the enmities he created at court led to his catastrophic demise being imprisoned at the Tower and subsequently tried and executed for treason in 1601. Gheeraerts’ portraits of the earl support a description of him given in a letter by a Venetian visitor in England after the capture of Cadiz, as: ‘fair skinned, tall but wiry; on this last voyage he began to grow a beard, which he used not to wear.’ Indeed, his distinctive red, square-cut beard became a trademark feature of his appearance. Devereux, much more than his contemporaries, quite consciously engineered his public image in an ambition to stand out from others, and the Gheeraerts commission can be regarded as a means of displaying his achievements, capabilities and superiority as a prominent courtier. He was fully aware that portraiture was valuable in creating a lasting record of the most significant achievements of his career and by employing Gheeraerts he benefited from having his image projected by a leading artist. Essex recognised the value of presenting his portrait to friends and associates, and consequently numerous three-quarter and bust-length versions were produced. The existence of these abridged versions suggest that Gheeraerts must have run a workshop in which assistants contributed to their production. Leicester ensured that Essex was preferred in a number of important ways at court. He was appointed as a commander of the cavalry in Leicester’s expedition to Holland in 1585, distinguishing himself at the battle of Zutphen. He succeeded Leicester as Master of the Horse in 1587, and when his stepfather died in 1588, Essex was already highly esteemed by Elizabeth, appointed as a member of the Queen’s Privy council. In 1589, he took part in Sir Francis Drake’s English Armada, after the Queen specifically forbade him from going. He returned after the failure of the English fleet to take Lisbon. In 1590, he secretly married Frances (1567-1632), the widow of Sir Philip Sidney, but the marriage was only revealed when it became clear that the Countess was pregnant, in 1591. Shortly afterwards she gave birth to Robert Devereux, Lord Hereford (later 3rd Earl of Essex). They had two more sons and four daughters together, despite Essex’s dalliances with other women at court. Later that year, the Earl left to lead English forces in Normandy, alongside the army of King Henri IV of France, but returned unsuccessful in January 1592. He was a Privy Councillor between 1593 and 1595, during which time he focused on foreign policy, European intelligence gathering and correspondence. Enjoying a high public profile, Essex received as many dedications as the queen during the 1590s and was a key patron of portraiture, poetry and music, as well as being a poet himself. The genesis of the earl’s demise as a result of forthright and irresponsible actions began only a couple of years after he was painted by Gheeraerts. He was created Earl Marshal in 1598. That same year, however, after an argument with the queen over the choice of a new Lord Deputy of Ireland, he removed himself from court. In 1599, as the new Lord Lieutenant of Ireland, Essex sailed there to command the queen’s forces against the Earl of Tyrone (as part of the Nine Years’ War, 1594 – 1603), but contrary to the monarch’s orders, conferred a large number of knighthoods on his soldiers, wasted funds, and garrisoned his men, all of which resulted in several defeats. Sensing that victory was no longer in his grasp, Essex reached a truce with Tyrone, independent of orders from the Crown. Although he was ordered not to return to court, he did, and was subsequently imprisoned. On 5 June 1600, Essex was charged with acts of insubordination whilst in Ireland and detained under house arrest, but granted his liberty on 26 August. Ruined, after the source of his basic income - the customs on sweet wines - was not renewed, disappointed and worried that the queen was being misadvised, following a controversial interpretation of Shakespeare’s Richard II, he led a band of three hundred men to march into the City in an attempted coup against the government. He had hopes of re-invigorating his position under the queen, as well as to convince her to consider James VI of Scotland as her rightful heir. However, the gates were shut, and Essex and his core band of men were arrested. His actions were misinterpreted as an attempt to overthrow the monarch; thus he was tried for treason and condemned to death. Essex was beheaded at the Tower of London on 25 February 1601 – the last person ever to be beheaded there. It could be argued that Essex was one of the few courtiers to experience the dramatic extremes of being at once at the height of the Queen’s favour, close enough to be regarded as her lover, and then absolutely cut off, literally executed. His reputation posthumously, however, remained a good one, and recent historians have praised his military strategy, intelligence gathering and patronage of eminent scholars. The portrait once formed part of the notable collection of Elizabethan paintings formed by Eric Bullivant, including other important portraits by Marcus Gheeraerts and Robert Peake, works now in Tate Britain and the Yale Center for British Art. In the composition at Woburn, Essex is shown as a man of towering proportions, standing on a rocky cliff overlooking the sea, the sacked port of Cadiz burning beyond. In this way, with his baton of command in hand, Gheeraerts conveyed Devereux’s status as military hero and victor against the Spanish in the grandest manner. Our portrait is one of a number of versions, including those at the National Portrait Gallery, London, Parnham House, Sussex, and Anglesey Abbey, Cambridgeshire. F. Gradenigo to the Venetian Ambassador in France, CSP Venice, 1592 – 1603, 9.238. Paul E. J. 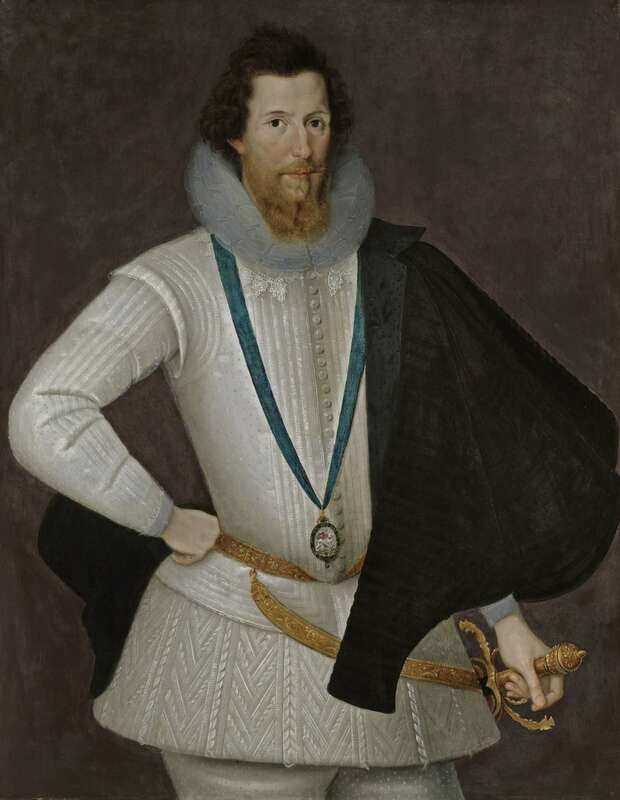 Hammer, The Polarisation of Elizabethan Politics: The Political Career of Robert Devereux, 2nd Earl of Essex, 1585-1597, Cambridge 1999, pp. 199-216, cited in Hearn, op cit.